Spring is in full swing, and hopefully your yard is coming out in full bloom. We want you to get out and fully enjoy your landscaping, so let’s make sure everything is at its top potential. This means not only having healthy plants and lush grass, but also incorporating hardscaping elements around your property. Today we are discussing the functional benefits of hardscaping. You may not be familiar with hardscaping. Its more popular partner, landscaping, often gets the attention when it comes to your time and budget. But don’t overlook the possibilities of adding walkways, retaining walls, and other hardscaping features. We have seen many different hardscaping applications, and want you to think outside the box to improving your property’s value and functionality. Controlling Erosion: Retaining walls, edging, and pavers can all help to manage water flow around your property. Reynolds Contracting specializes in both hardscaping and earthwork services, so its easy for us to add drainage or change the grade as necessary around your property. With the right hardscaping elements, you can address erosion problems while increasing curb appeal in one fell swoop. Directing Traffic: You have planned and planted beautiful bushes, flowers, and trees around your property. The last thing you want is someone walking through your flower beds, trampling your lovely vegetation. Alternatively, you want to show off your green thumb and need guests to be able to view your gardens. The best way to direct traffic around your property is with sidewalks and paths. We can help you pick the best route and material for your specific property. 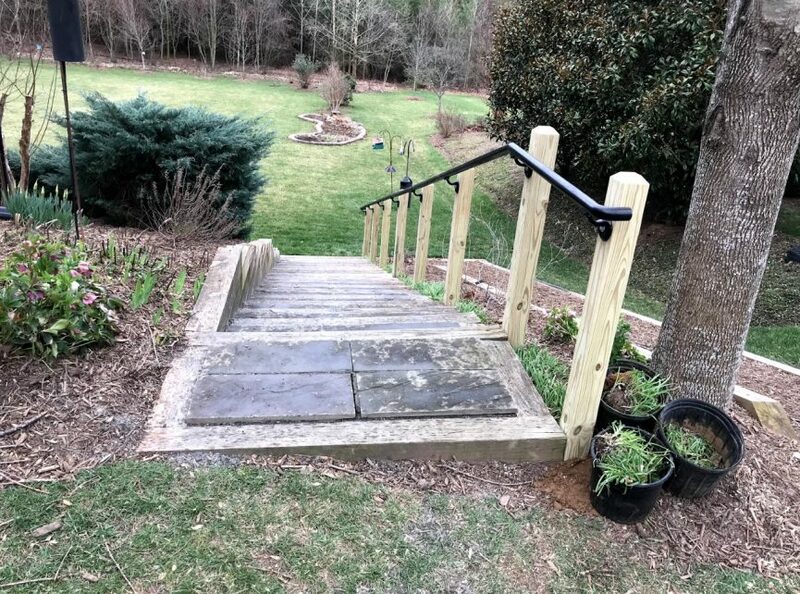 Increasing Safety: On a recent job, we added a handrail to a set of steps. 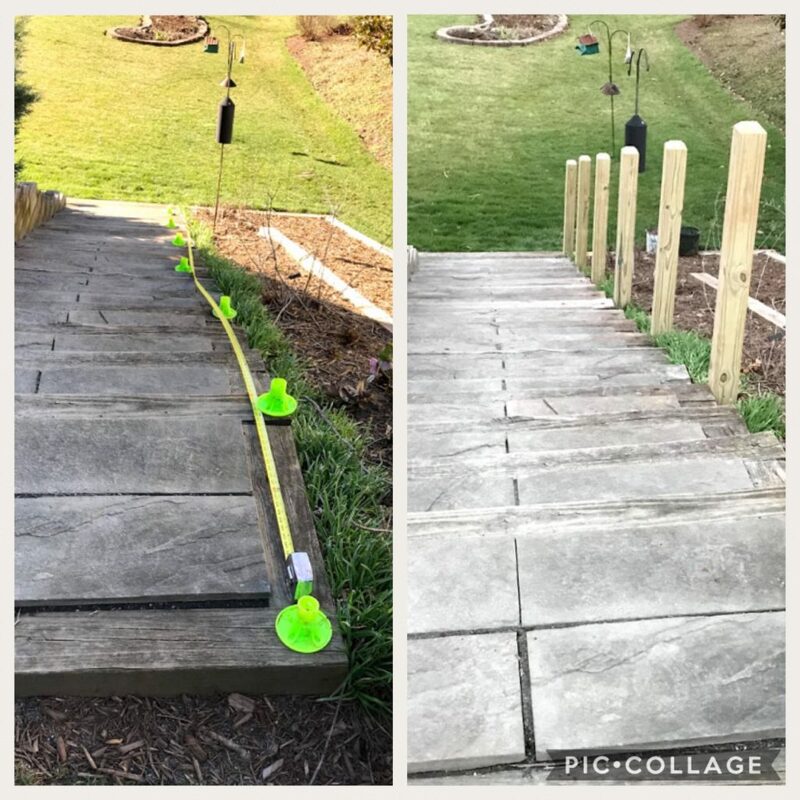 Another contractor had installed the staircase, and we increased the safety of the hardscaping feature with the handrail. Always keep safety in mind when adding hardscaping to your property, especially when it comes to paths, walkways, and staircases. Improving Plant Survival Rates: Container gardening is a great way to show off your green thumb, due in part to its ease and simplicity. Add built-in containers to your landscaping to make watering and weeding easier. You can also easily space your plantings with containers. Reducing Mud: Similar to Benefit #1 above, hardscaping can reduce the mud around your property with the use of patios, walkways, and staircases. Have a high-traffic area? Add some stones or stamped concrete to add dry footing and charm to your home. Patios in particular help keep your shoes clean closest to the entrance to the house, so there’s less chance of tracking mud inside. Now that you know the functional benefits of hardscaping, we can start adding some of these features to your property. Give us a call 434-293-6724 for an estimate today!